An outdoor deck is the perfect way to extend your living area and give the kids a space to play! Bench seats also make the perfect toy box to hide away all that clutter. We’ve got some great ideas for your perfect deck. Bring the inside out and the outside in with a flowing space that is safe and kid friendly. A well-crafted deck can add value to your home and give you more space to entertain, relax or simply enjoy your backyard. What’s more a deck gives your kids a great space to play! A beautifully designed timber platform can enhance any outdoor space and it’s a terrific way to enlarge your living area. If you’re looking for additional features please ask. We’ve worked at schools and preschools and built lots of decks for families with kids. This timber bench seat is hinged for storage, great to hide away your outdoor clutter, toys and gardening tools. A new deck can cost anything from $5,000 to $30,000 depending on the size, choice and style of timber and the optional extras to suit your lifestyle. You will probably get 3 quotes and the happiest people are the ones who don’t necessarily choose the cheapest quote. Our clients choose Pacific Coast Carpentry for the exceptional quality of our workmanship. We encourage you to visit one of our previous projects to see for yourself. Choose the timber that’s right for you. 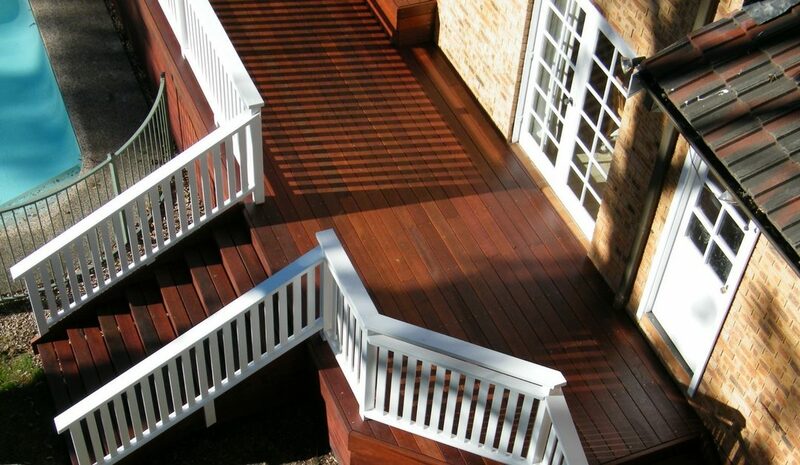 Whether you’re looking for low maintenance, eco or composite decking, a timber to suit your budget or Australian hardwood make sure you research your options. Safety handrails should be at the right height as recommended by NSW Building codes. Timber bench seats are essential for kids toys and back yard clutter. Fun additions like kids climbing walls, skate ramps, treehouse, cabanas or timber boat sandpit can make your outdoor area fun for years to come. Lighting offers a great evening ambience so you can enjoy the outdoors once the kids are tucked up in bed. It’s a good idea to have an idea of your budget – knowing the size of your deck and any inclusions you would like upfront will give you an indication of whether the project is within your budget. If you want more room to enjoy your backyard contact Pacific Coast Carpentry for a free quote.